Berwick Viewfinders Camera Club Inc. Front Door - Berwick Viewfinders Camera Club Inc.
Don’t forget the Autumn Challenge. It is open. See the competition page. Special request. Call from Members by web-masters. 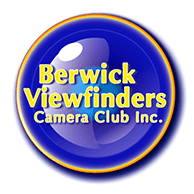 Berwick Viewfinders Camera Club Inc., (BVCC) is an active camera/photographic club based in Berwick, Victoria, Australia. Berwick is an outer, south-east suburb of the city of Melbourne. We meet on scheduled Mondays at 7.30 pm at the Berwick Senior Citizens Rooms, 112 High Street Berwick. Check the Calendar of Events if you would like to attend a meeting or an outing. We welcome visitors, for a couple of meetings/outings, to see if the activities suit you and you would like to join. Club nights include internal photographic competitions, practical workshops, speakers, special outings, etc. There are also occasional field trips at the weekends and extended trips on long weekends. Members also arrange informal outings at other times. BVCC also participates in Inter-Club competitions with other photography clubs/societies. One of the objectives of the Club is to help members improve their photography, both technically and aesthetically. The Club makes this enjoyable by building a friendly and comfortable atmosphere. Members range in age from teenagers to active retirees. Check the Calendar of Events and get in contact via our Contacts page. BVCC is a member of the Victorian Association of Photographic Societies Inc.
Latest VAPS Newsbrief is here. You can also visit the club’s Facebook page. See the link at the top of the page. Just come along to a meeting as a starter. You will be welcomed. Also, if you like, see the contact page and you could let us know you are coming. Check the calendar menu item for what is on.